Americans tend to be in one of two camps concerning the religious beliefs of the Founding Fathers. Those who believe the leaders were Christians determined to create the republic as a Christian nation. The other camp believes the country was founded in a secular manner with care being taken to “build a wall” between church and state. His examination, among other things, focuses on the words these men used when talking about God in a personal letter to a family or a friend. Reading these letters bypasses the political persona of the leaders and shows what they said in private. Holmes zeroes in on specific words these men used concerning God or their use — or nonuse — of Christian phrases. For example, a Deist usually avoided traditional Christian phraseology using “the Grand Architect” instead of “God,” while Christians like John Adams would sprinkle “Redeemer of the World,” or “the grace of His Holy Spirit” throughout a letter. Besides these six men, Holmes examines the men’s wives and a few of their children to see what family traditions and beliefs were passed on. The book concludes with a two-to-three paragraph about each of the modern presidents — beginning with Gerald Ford and ending with George W. Bush (who was president when the book was published). Even though I found the whole book intriguing, the most interesting section was Holmes’ discussion, at the beginning of the book, about the religious climate during the Revolutionary War era. In this section, Holmes reports which church denominations existed in each of the 13 colonies, and their specific beliefs. This detailed account provided a picture of the variations of Christian doctrine and dogma that existed when the country was born. 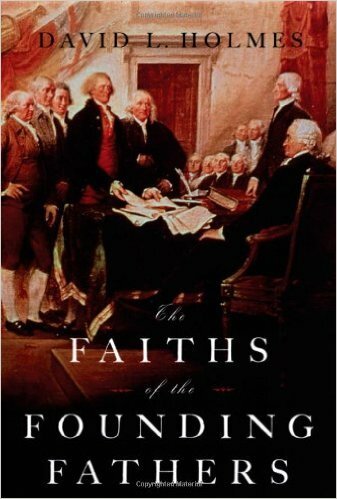 Rated 5 out of 5: The Faiths of the Founding Fathers is an interesting read and a great introduction into the religious beliefs of the Founding Fathers. It also sheds some light on how those beliefs played out publically. With only 185 pages the book is also a quick read. Did Holmes include any of these quotes from Benjamin Franklin? Holmes’ book is a short book, so he would not have included all those quotes. However, his theory that Franklin was a Deist is fairly well substantiated by Franklin’s own words including his letter to Ezra Stiles near the end of Franklin’s life. If he was a devout Christian, he bypassed one of the most common methods of proving it — church attendance. He chose early in his youth to avoid Sunday worship and used the day, over the course of his life, to educate himself. Thanks for your comments. If you haven’t read Holmes’ book — it is a nice, short introduction to the topic. I will add your book to my list of books to read.